Everyone who lives and/or works in France is required to have health insurance. In fact, it’s treated as a fundamental right in the Constitution with the Preamble stating that the Nation “shall guarantee to all, notably to children, mothers and elderly workers, protection of their health….” When applying for our visa that allowed us to stay here during the first year we had to prove that we had health insurance coverage that would take care of any emergency situations plus pay for sending us back to the US for treatment of anything serious and/or long term during the one-year validity of our visa. A common benefit of travel insurance is repatriation to the country where your trip began, so a policy for that was easy to find and accepted for the visa application. 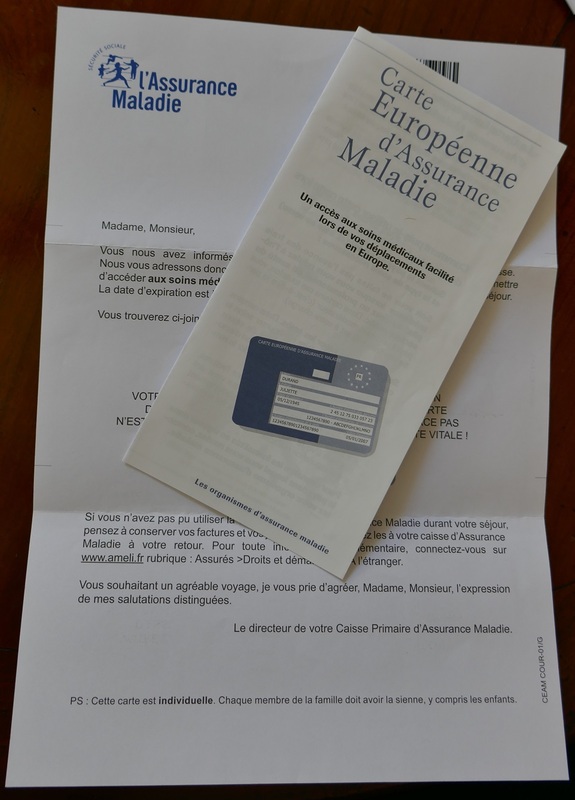 Once you’ve lived in France for at least 3 continuous months you become eligible to apply for Protection Universelle Maladie that we think of as universal health care and we have now been accepted. Now that we each have our Carte Vitale which is our ID card to show that we are part of the French healthcare system, we present that at the doctor’s office, hospital, laboratory, pharmacy, etc. Coverage is generally 70 percent of the cost of the procedure leaving the patient to pay the remaining 30 percent out of pocket or to buy a private top-up insurance policy. Within 2 years from now, coverage for dental, vision, and hearing problems will increase to 100 percent. Anyone who has a long term disease such as cancer or diabetes is already covered at 100 percent as are people who are unable to afford additional insurance. While our Carte Vitale covers us within France, when we travel outside of the country to other members of the European Union we have a separate card to present should we need medical attention while on vacation. We are then covered just as if we were at home. For trips outside of Europe you buy private travel insurance to cover emergencies and to transport you back to France. To apply, we printed out form 736 Demande d’ouverture des droits à l’assurance maladie and took it into our local CPAM (health insurance) office along with our residence card, birth certificate, electric bill for 3 months, and our banking information. These were the minimum requirements as printed on the back of form 736 but we also took form S3704 Déclaration de choix du médecin traitant, signed by our doctor, who in the US would be called our Primary Care Physician. We understand that other applicants have been asked for additional documents. As with every other government agency that we’ve worked with here, despite our far-from-perfect French, we were treated kindly, efficiently, and with respect. About a month later we each got a letter with the code required to initiate the opening of an online account. It’s a 2-step process to decrease fraud so 7 days after that another letter arrived with the second code we used to finalize the account and request our Carte Vitale and the European health card. In summary, it took about one month to get a letter confirming that we had been accepted into the national health system and then an additional month for our ID cards to arrive. So what does it cost us to belong to universal health care? That depends upon whom you ask. Employed people and their companies make contributions through payroll deductions. Others pay 8 percent of their household income based on their annual tax returns. There are exceptions to that, for example the unemployed, but also for those who receive a retirement pension and declare that as such on their tax return. We fall into that final category and have even had our neighbors read the regulations to make sure that we are translating them correctly. We’ll have to wait until next year to see if the tax authority agrees. In the meantime, at least we know that we have health insurance. We now have Medicare parts A (hospitalization) and B (doctors) back in the US to think about. When you’re out of the country, be it for vacation or because you’ve moved, you’re not covered by Medicare. Part A is at no extra charge but Part B currently costs $134 per month per person. If you live in the US and wish to cancel Part B there is a form to send in to confirm your understanding that should you wish to rejoin the system there is a penalty equal to 10% of the monthly premium for each year that you were not part of the system. If your home is in France, perhaps because it’s a common request to stop paying for something you cannot use, cancellation requires just a written statement to the US embassy in Paris. Earlier in the year I watched a short TV interview with the Prince and Princess of Norway who were asked why their country had been voted the happiest country on Earth. Their answers included having a stable economy, free education, and access to health care. On that last point the Princess elaborated, “the fact that you have a social system that will take care of you if you get sick, or if you’re not able to work for other reasons…people need to feel safe. If you don’t feel safe, you aren’t happy, and you aren’t able to take care of your family.” She also talked about how much Norwegians love nature and concluded with “If you are in a Norwegian household on Sundays…you have to go for a walk.” Here in the happy south of France we agree and, hey, it’s Sunday. We’re going for a walk! Posted on October 7, 2018, in Dealing with government, Life in France and tagged Americans in Carcassonne, Insurance, Life in France. Bookmark the permalink. 7 Comments. A very good explanation of how to enter the health care system in France! One of the happiest days of my life was the day I received my Carte Vitale several years ago. This year I opted out of Medicare Part B, thus increasing my monthly Social Security payment. I’ll never understand why the US doesn’t have universal health care. I really appreciate this detailed explanation! I am looking forward to my “permanent” move to France and I know that this will help me and my husband decode the process. This is our experience exactly. Those planning an expat life should also research mutuelles, particularly in comparison to the RO (régime obligatoire, I think). Actual medical costs may sometimes be much higher than 30% because the basis may be much more than 100%. We’re very happy with our french coverage, but we have had a surprise or two. How did you arrange the insurance from the US to tide you over — and you imply it’s needed only for three months, although I’d thought it was necessary to get coverage for a year. We used World Nomads travel insurance and it was accepted for the one year term of our visa. Due to the changes in the political climate the requirements might have changed so you should always check with the French consulate website to see what is required currently. 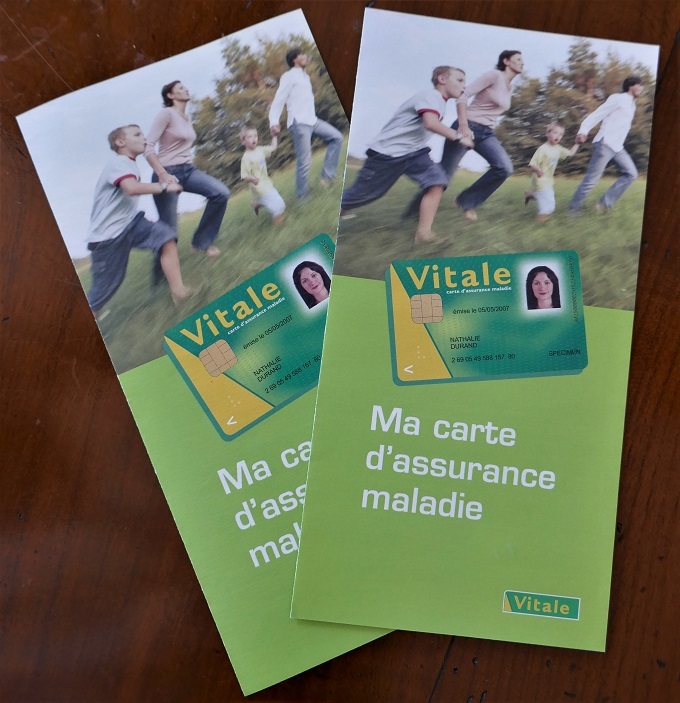 Once you are a stable resident of France for at least three months, with a local bank account, you can apply for your Carte Vitale health insurance.